On his first day as a volunteer for the Friends of Knight Memorial Library, in March of 2014, John Marks (no relation) was asked to help finalize prices for 200 books and sets that had been selected and pre-priced for one of the library’s twice-annual, vintage-book sales. One of these was a five-volume, 19th-century Torah, grandly titled “The Law of God” and edited and translated by Isaac Leeser. The publication date was listed as 5605 in the Jewish calendar, which in the Gregorian calendar is anywhere from the fall of 1844 through the summer of 1845. Normally Marks is not so casual with such details. He is, after all, a senior contributing editor and columnist for “Stereophile” magazine, who also does “episodic” work as a classical-music record producer. That means he’s one of those people whose ears can discern the difference between the sound of recorded music played through tube versus solid-state amplifiers, and he’s enough of a classical-music aficionado to occasionally produce entire records of the stuff. 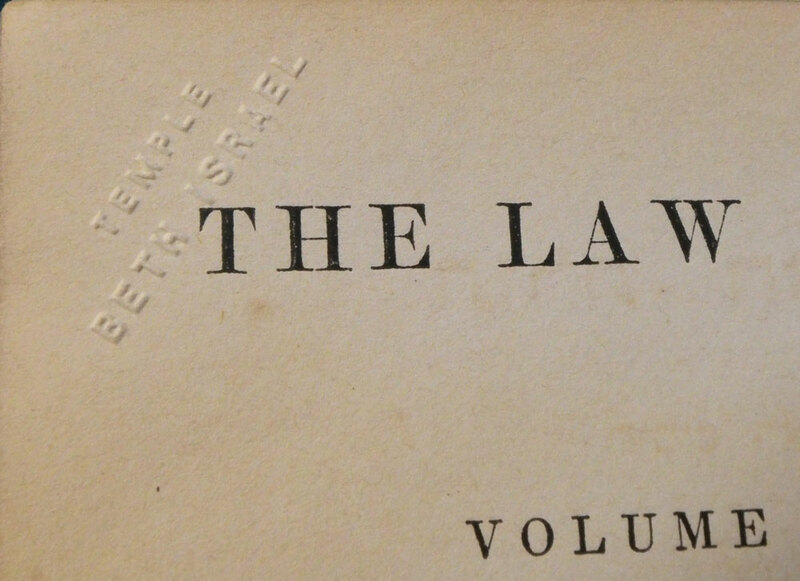 Above: Each of the outside spines of the 1845 version of Isaac Leeser’s “The Law of God” is titled “The Pentateuch,” which is another word for the Five Books of Moses, a.k.a., the Old Testament. 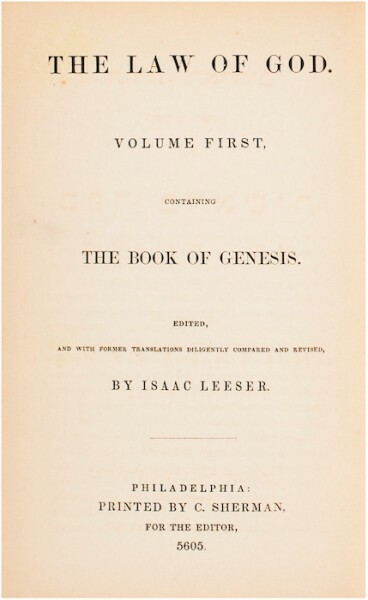 Top: The English and Hebrew facing pages of the Book of Genesis. Every few weeks, Marks takes this passion for wading deep in minutiae to the community library near his home in Providence, Rhode Island. There, he sifts through and helps organize the surprisingly impressive collection of donated classical LPs, as well as the tons of books (yes, literally tons) that have been contributed to the Friends for their ongoing sales. Like a lot of neighborhood-library support groups, the Knight Friends cherry-pick the best of the bounty people regularly leave on their doorstep and put them up on eBay to help offset the perennial funding shortfalls that plague little libraries across the United States. Marks is a cherry-picker, and while his efforts don’t completely close his library’s budget gap, selling a few extra records and books is probably easier, and more fruitful, for Knight Memorial than cleaning up after a bake sale. Especially if you occasionally turn up books like the Leeser Torah. Recently, we spoke with Marks about this important piece of Jewish American history, and what it tells us about Jewish life in mid-19th-century America. Collectors Weekly: How did you get involved with the Friends of Knight Memorial Library? John Marks: I had recently moved into the neighborhood, and it turned out that my landlord, Doug Victor, was in charge of volunteers for the library’s book-sale activities. He said, “If you want to meet people in the community, come down to the library and do some volunteering.” I said, “Well, if it’s something I’d be good at, sure.” He said they had a donated collection of classical vinyl that went back to the earliest mono recordings in the LP format, so he asked me to look through them and see if some of the stuff had value—to hand them off to record shops or put them on eBay. On my first day to help set up for a Saturday sale, they also asked me to price some books, a total of 200 book sets and titles. So I looked through the books that had been selected. When I got to “The Law of God,” I assumed it was exactly the kind of thing an upwardly mobile, 19th-century Jewish family would have had on display in a prominent position in the living room, like the ornate Douay-Rheims Bibles that had been fixtures in 19th-century Lace-Curtain Irish homes. Believe me, I speak from personal experience on that. Douay-Rheims Bibles were sold door to door in Irish neighborhoods on credit—14 monthly payments of $1 each. They were huge, with brass clasps to keep them closed and a lacquered cover that looked like carved wood, except it was built up of layers of die-cut cardboard. You can still find them on eBay. People think their family heirloom is worth $400 or $600, but in excellent shape a Douay-Rheims Bible can be had for about $100. Thinking it was the same sort of thing, I valued “The Law of God” at $100. The covers of each of the five books in Leeser’s “The Law of God” are bound in tooled calfskin. Collectors Weekly: Then what happened? I must have been having writer’s block or something because I started looking into it that Monday. I started on eBay, looking up the completed sales, but there was nothing. I thought, “This thing didn’t come from a UFO, let’s see what Wikipedia has to say.” And it was there that I learned that “The Law of God” was the first English-Hebrew, facing-page translation by a Jew rather than a Protestant. This was major; this had to be worth something. Since the book had been published in Philadelphia, I did a search of all the Jewish booksellers in Pennsylvania, and sure enough, I found one that had sold a Leeser Pentateuch—for $6,500. In the early 1900s, “The Law of God” sat in a synagogue library, apparently unread. Collectors Weekly: What makes this copy of ‘The Law of God’ so special? Marks: To begin, we’re talking about a rare set of books—the WorldCat.org database says there are only 27 complete sets in libraries worldwide. 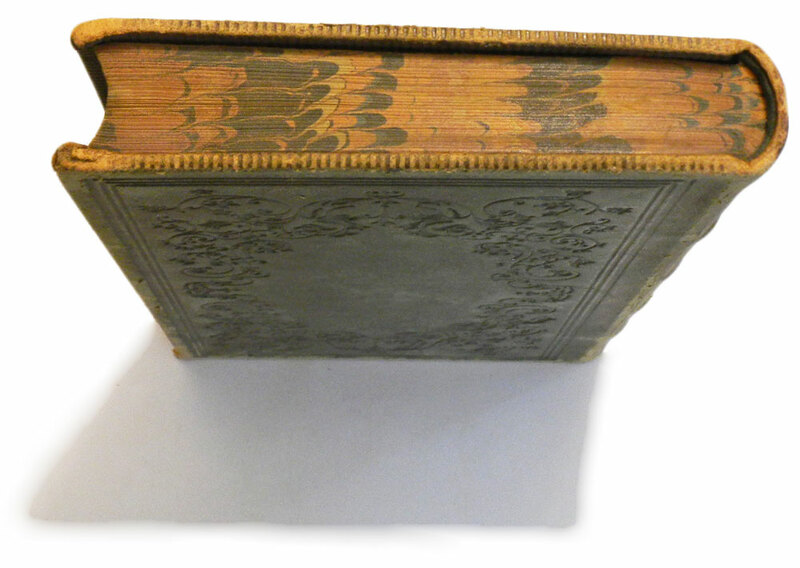 And this was the first edition, in deluxe binding with tooled calfskin and beautiful marbled end papers and page edges. The Hebrew type is all hand-set, with the diacritical marks added in the ledger lines. My surmise is that Leeser got the synagogue big shots to fund his translation, so this version was probably produced as a fancy thank-you gift, like a Kickstarter reward. By the 1880s, when photoengraving became a reality, somebody in Cincinnati did a quick knockoff of “The Law of God.” That you can buy today for a hundred bucks, but not this. Collectors Weekly: How is the Leeser translation different from others before it? Marks: There had been translations of the Torah in America, England, Holland, and elsewhere, but they had always been done by Protestants, who had one of two (sometimes both) agendas. The first was to show that the Catholic translations were corrupt. The second was basically to proselytize—to amp up the stories in the Old Testament so that they prefigured and telegraphed Jesus. Collectors Weekly: In other words, to make the Old Testament a prequel? Marks: Yes, so they could go back and say, “Jesus is the promise of the ages!” If you read Leeser’s introduction, he admits that while he relied an awful lot on the King James translation, he has corrected the apologetic and proselytizing tendencies of the Christian translators. This was the first translation by a Jewish scholar. It made a big, big difference. The end papers and edges of “The Law of God” are beautifully marbled. Collectors Weekly: How is Leeser’s translation regarded today among scholars? Marks: Derivative. Leeser had what was basically a junior-high-school-level Jewish education in Germany before he came to the United States. A generous uncle sponsored his religious studies in Philadelphia, but he’s essentially one of these self-taught geniuses. By some accounts, he was a very prickly character. He never became a rabbi, and there was an aspect, I think, of anti-clericalism to him. I don’t think he particularly liked the synagogue big shots who sponsored his translation, but they were probably a means to an end. Leeser went on to have an extensive career as, for lack of a better word, a controversialist. He had sharp elbows, no question, when it came to asserting the rights of Jews to participate in American democracy and culture. His was the first eulogy ever printed by a Jewish religious figure for an American president, Benjamin Harrison. And Leeser was so bold as to write to President Lincoln to request the appointment of a Jewish chaplain during the Civil War. Not surprisingly, perhaps, he had a spotty employment record. 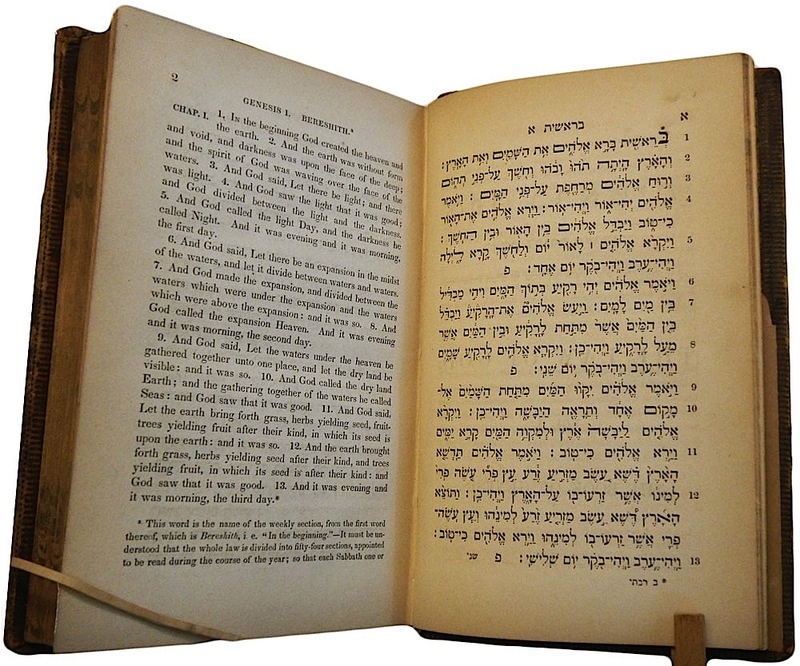 He didn’t stay in one place too long, but his “The Law of God” was the standard, high-quality Jewish facing-page Torah translation in the United States until 1917, when the Jewish Publication Society completed its Old Testament. Collectors Weekly: Were there also prominent Jews in the South during the Civil War? Marks: There are two factoids that should set all Southern Evangelicals back on their heels. First, the Secretary of State of the Confederacy was Jewish, a man named Judah P. Benjamin. And the only polity in the world that recognized the Confederacy was the Vatican. 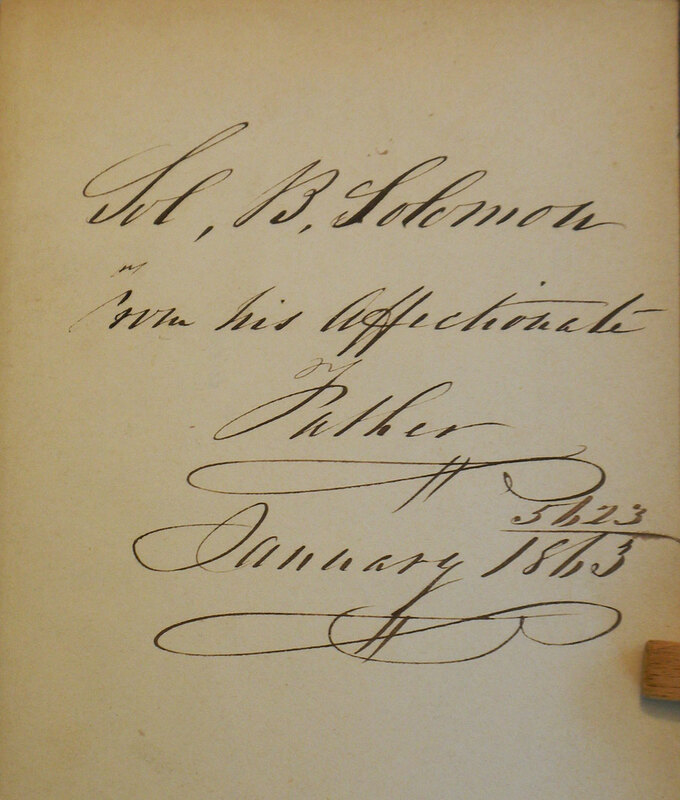 The inscription inside the first volume of the set, dated 1863, is to a prominent New York Jewish leader named Solomon B. Solomon. The writer is Solomon’s father. Collectors Weekly: The Leeser Torah in the upcoming Sotheby’s sale is inscribed to Solomon B. Solomon. Who was he? Marks: Well, Solomon B. Solomon’s father was from England, so Solomon probably grew up learning that it was a sacred mission to prove to the gentiles that Jews were every bit as good as citizens as they were. The role model for many young English Jews was Prime Minister Benjamin Disraeli, who was a convert from Judaism. As a result, the so-called Portuguese Jews in New York, the Sephardic Jews, regarded the English Jews as the most assimilated and least reliable to continue practicing the faith. That’s actually why Leeser did his translation. He was very involved in a Sunday school so Jewish youth wouldn’t be tempted to become Presbyterians or Episcopalians, to give them something to socialize around on Sunday and meet other nice Jewish children. “The Law of God” would be their textbook. In a way, Solomon B. Solomon was Leeser’s target audience. He was one of the biggest assimilators around, although he was also the publisher of a Jewish newspaper in New York City called “The Jewish Messenger,” president of West End Synagogue, and I believe he was a founder of Mt. Sinai Hospital and the Young Men’s Hebrew Association on 92nd Street. The foundational meeting for what became the “92nd-Street ‘Y’” was held in his living room. One of Solomon’s crowning social achievements was to get wealthy nouveau-riche WASPs, the robber barons—the people who profited from the Civil War and the railroads—to attend a fancy-dress event called the Purim Ball. So, Solomon was a part of that group of New York Jews who were loosening up, beginning to enjoy life. If you look his newspaper, it listed four goals in every issue. The first positions Judaism as “higher than synagogism,” which must have seemed a slippery slope to many Orthodox Jews at the time—pretty soon your son is bringing home his fiancée, and she’s blonde, blue-eyed, and is eating a ham-salad sandwich. Collectors Weekly: Did Orthodox Jews view Leeser’s two-language translation as a kind of heresy? Marks: Well, they almost certainly thought it was unnecessary. But I would love to know how Orthodox Jews viewed the fact that the Hebrew characters of the Torah were “kissing” the English, and vice versa, as the pages folded together. Was that a scandal? That’s a fascinating intellectual question, but I don’t know the answer. An embossed stamp, evidence of the set’s years in a synagogue library. Collectors Weekly: What happened to Solomon’s copy of ‘The Law of God’? Marks: The books passed out of Solomon B. Solomon’s hands sometime before 1904, because there’s a notation that a collector named Henry Woolf had put his name in one volume in 1904. Then, at some point later, Woolf or his heirs donated it to a synagogue library. There’s one date stamp on the library card, but I think that’s the accession stamp. I don’t think anyone even looked at it. Collectors Weekly: If the books sell as you hope they will, are you worried that the donor will show up and say, ‘Hey, wait a minute’? Marks: Well, obviously we’ve had this discussion with Sotheby’s, but we’ll cross that bridge if we come to it. Knight Memorial Library has kind of become the book-donation magnet for Providence. I believe “The Law of God” came in something like a Chiquita banana box, along some other books on spirituality—by Carlos Castaneda, Ram Dass, that sort of stuff. There were lots of other books donated at the same time. We assumed the books had been inherited from a grandparent, and that the owner was either downsizing or just wanted to get rid them. “The Law of God” languished for months before one of our twice-a-year vintage-book sales came up. I think we are on solid ground to sell it. 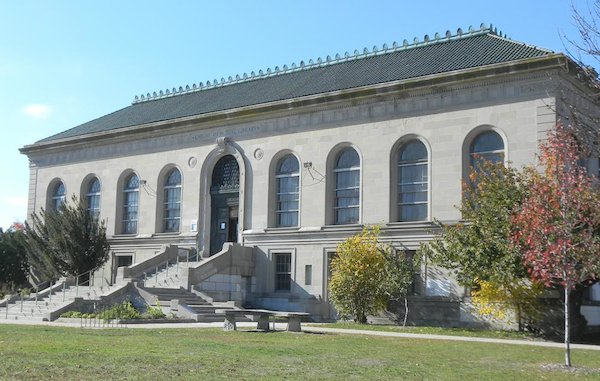 If a donor ever turns up and makes a claim, the Treasurer of the Providence Community Library can send them a letter stating the net proceeds from the sale, and the claimed donor can give that to the IRS. Like a lot of community libraries across the United States, Knight Memorial in Providence, Rhode Island, is increasingly reliant on the efforts of volunteers to fill gaps in government support. Collectors Weekly: Hopefully this will be a major score for Knight Memorial, but what are most of your finds like? Marks: We sold several other noteworthy books that had been in that group of 200. 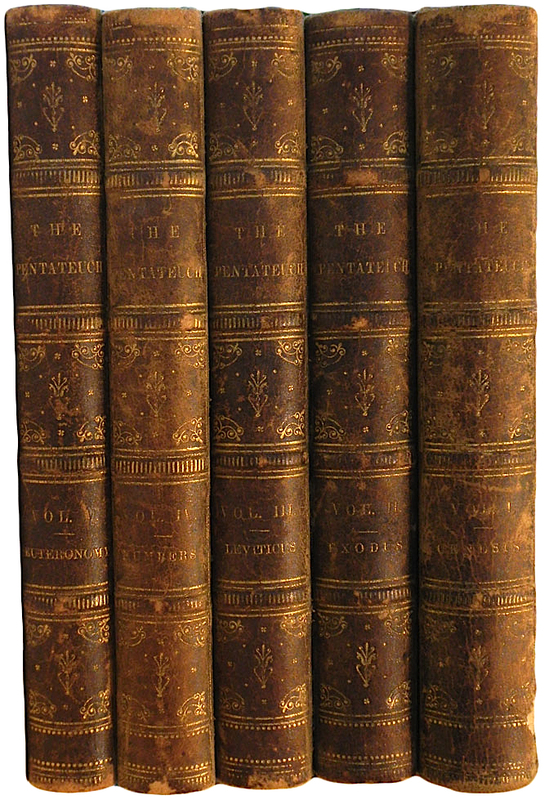 One was a single volume from a four-volume leather-bound set of “Don Quixote,” printed in 1717 in Glasgow, Scotland. It was a well-used book, but it just looked so historical, and I think I had priced it for the sale at $80. After lots of wrangling and being up on eBay two or three times, it sold for $23 or $26, something like that. A better outcome were the four LPs I sold to a guy in China for $400—he also paid $265 in shipping, tracking, and insurance on top of that. The LPs included a first pressing of Joseph Szigeti’s “Unaccompanied Bach” (on the Bach Guild/Vanguard label), and other similar rarities. There’s a huge amount of classical-music LP connoisseurship in China right now. 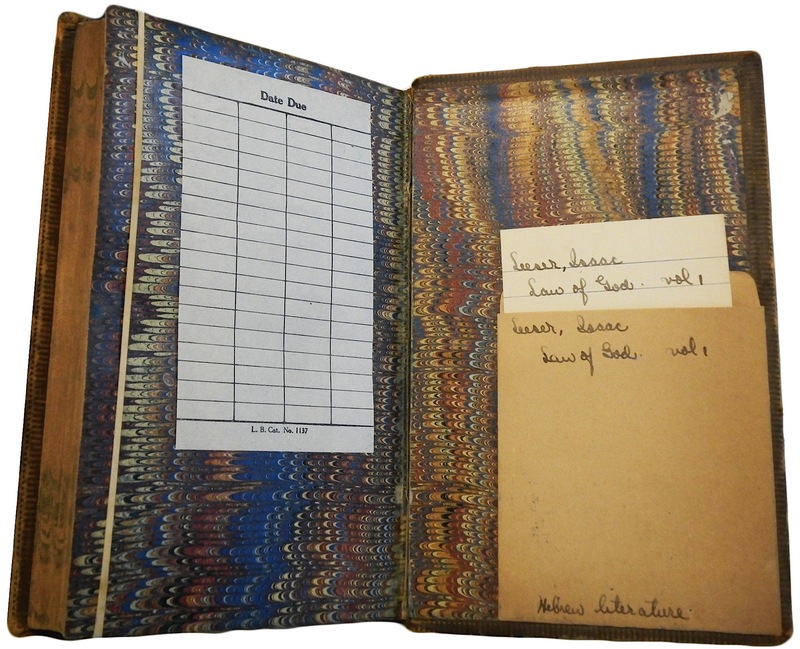 Thank you for your great site – I collect Antique leather back books and would like some idea of their worth- I will go to the Show and tell Gallery. Hi, I have a very similar book. The spine is the same and the inside mottled paper is the same in appearance, but it is called Josephus. This book is complete in one volume, in which is added three dissertations. 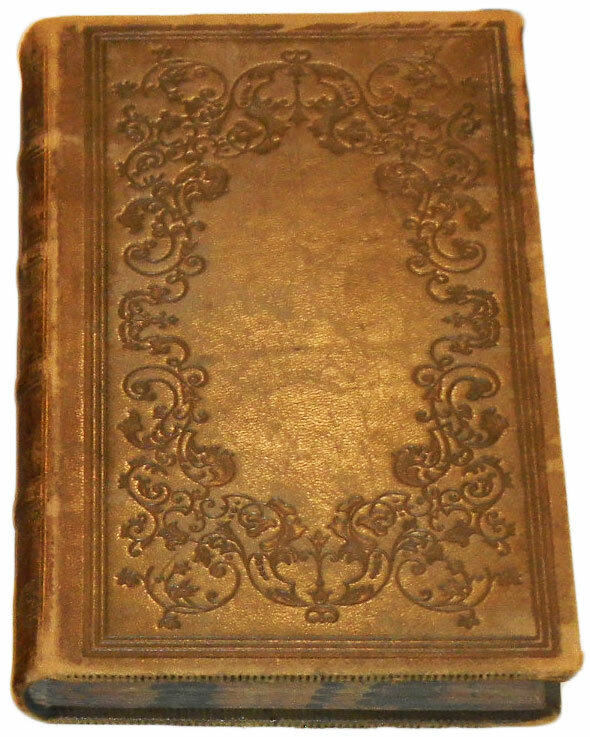 The works of Flavius Josephus – translation Willam Whiston A.M.
Can you give me some information on this, is it also part of your collection? “ ” It's the Horiuchi collection, the absolute pinnacle of Tiffany.